Today we got to be a small part of Michelle and Adam’s special day, Congrats. Set The Mood Decor was there for the full day, we did all of the bridal flowers, pew balls at the church, venue decor and centerpieces. 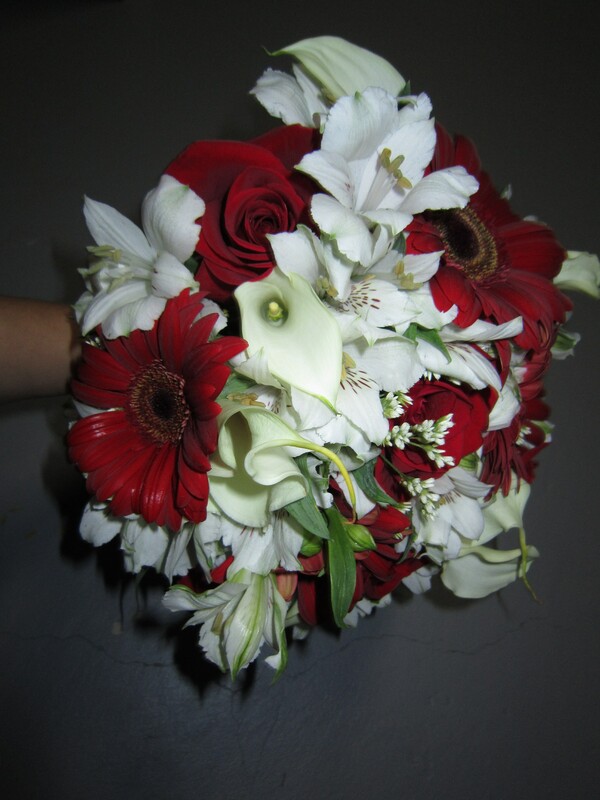 Michelle’s bouquet consisted of red roses, red gerbera, white alstro and white mini calla lilies. The bridesmaids had white roses and white alstro with some other small white filler flowers. The red brought in the red theme which was also the color of the bridesmaids dresses. 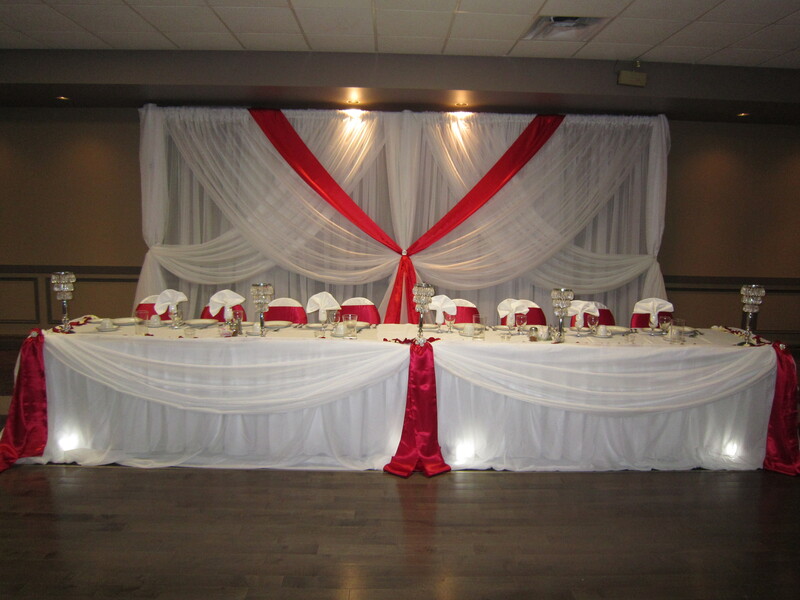 The venue was Club Capri in Thorold to complete their vision at the venue we provided white satin chair covers with red satin sashes. Full Head Table Cake Table Draping in sheer white linen with spot lights. 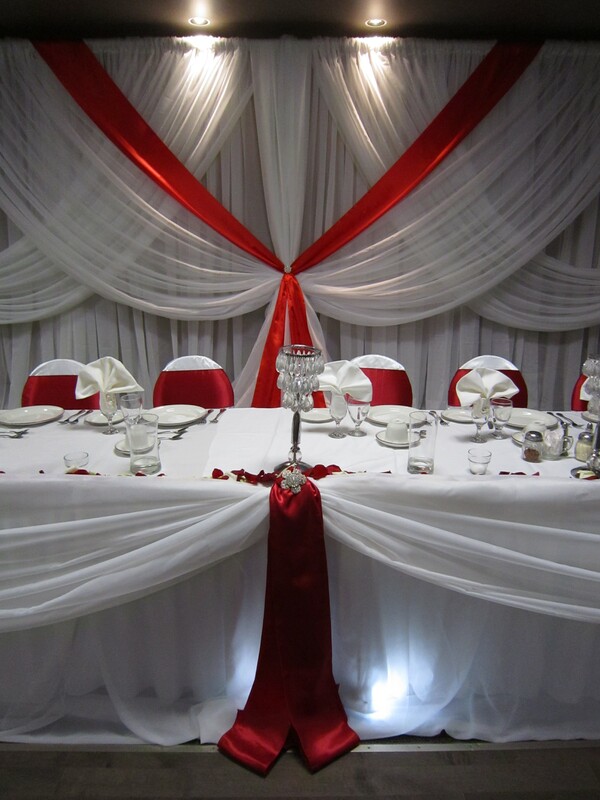 We completed the tables with some red satin for the pop of color and out crystal embellishments and crystal chandeliers for the head table. Set The Mood Decor also provided a fancy style backdrop with red sating accent. 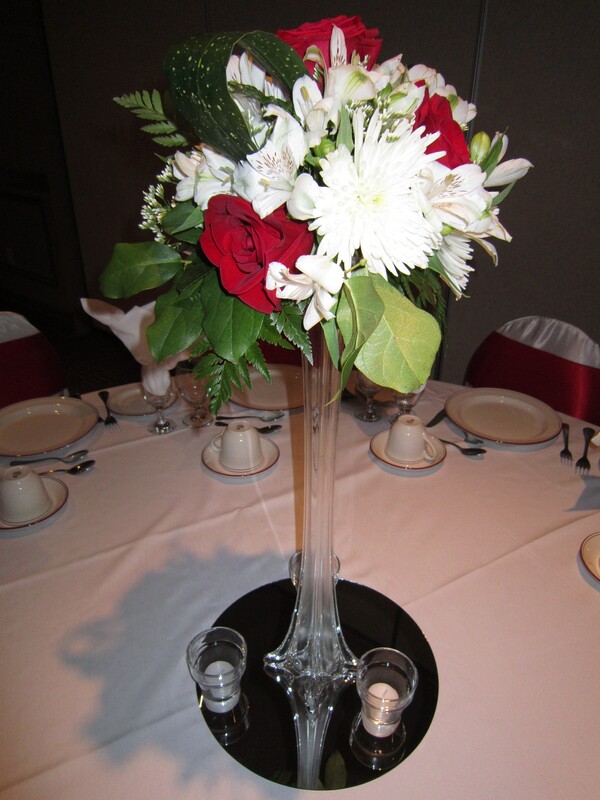 For the centerpieces we went with an Eiffel tower vase and an arrangement on top. The arrangement included, roses, alstro, spider mums, green and white fillers. Thank you to the bride and groom for letting us be a part of their special day!!! We wish them all the best! Today we got to decorate a plum themed wedding for Marc and Katie. 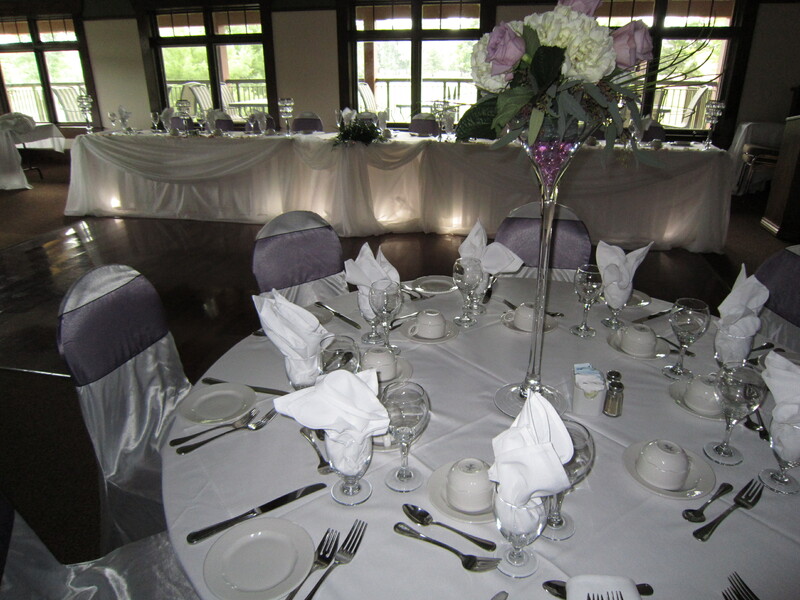 Set The Mood Decor provided the white satin banquet chair covers and the plum organza sashes that we tied in the traditional bow style. We draped the head table, cake table and receiving table in sheer white linen with the swag in sheer white linen as well. 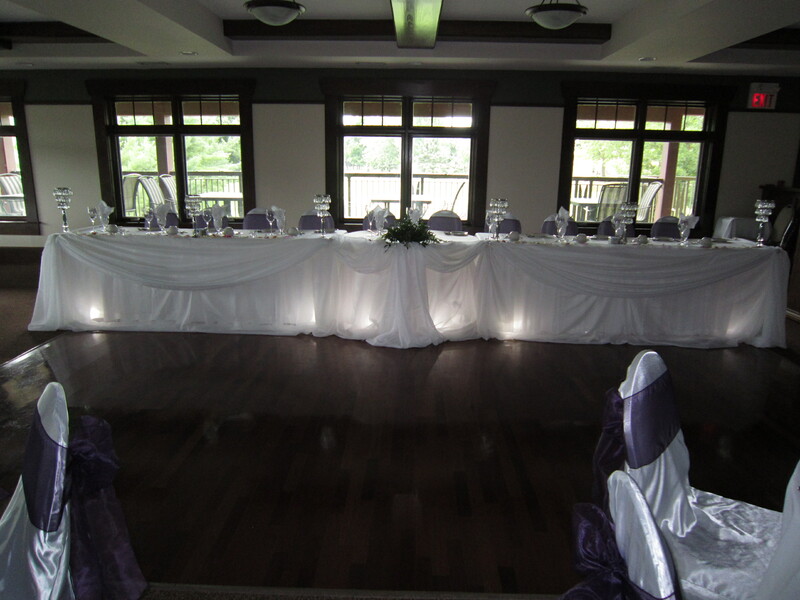 The head table and cake table where up light with our cordless led lights; which makes for no lights getting hot and no cords for the bridal party to worry about. We added a few little accessories, like the crystal brooches to the focal points on the tables, our crystal chandeliers for the head table with a few tea lights, also lite up by led lights. Last but not least rose petals just to complete the look and add the romantic mood. The gorgeous centerpieces where done by the brides aunt, she did a great job and they matched perfectly with everything in the room! 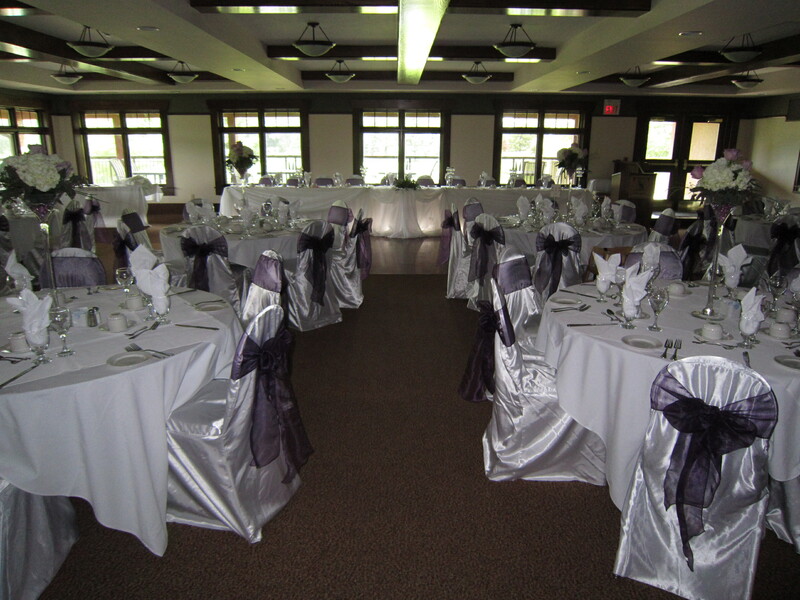 We would like to thank Andrew at the venue, Twenty Valley Golf and Country Club, in Vineland for all of his help.